Avalanches are one of the most natural hazard in the mountain areas and therefore, identification of avalanche hazard is necessary for planning future development activities. The study area falls under the international boundary region which generally covered by the snow (38%) on high altitude regions of the western part of Himalayas. Avalanches are triggered in study area during snowfall resulting in loss of human life, property and moreover the transportation and communication affected by the debris which ultimately delays the relief measures. Therefore in this study three major causative parameters i.e terrain, ground cover and meteorological have been incorporated for the identification of avalanche hazard zones (AHZ) by integrating Analytical Hierarchical Process (AHP) method in Geographical Information System (GIS). In the first part of study, avalanche sites have been identified by the criteria related to terrain (slope, aspect and curvature) and ground cover. Weights and ratings to these causative factors and their cumulative effects have been assigned on the basis of experience and knowledge of field. In the second part of the study, single point interpolation and Inverse Distance Weighted (IDW) method has been employed as only one weather station falls in study area. Accordingly, it has been performed to generate the meteorological parameter maps (viz. air temperature and relative humidity) from the field observatories and Automatic Weather Stations (AWS) located at Baaj OP in Uri sector. Finally, the meteorological parameter maps were superimposed on the terrain-based avalanche hazard thematic layers to identify the dynamic avalanche hazard sites. Conventional weighted approach and Analytical Hierarchical Process (AHP) method have been implemented for the identification of AHZ that shows approximately 55% area under maximum hazard zone. Further, the results were validated by overlapping the existing registered avalanche sites. The sites were identified through field survey and avalanche data card followed by its delineation from the toposheet (1:50,000 scale). 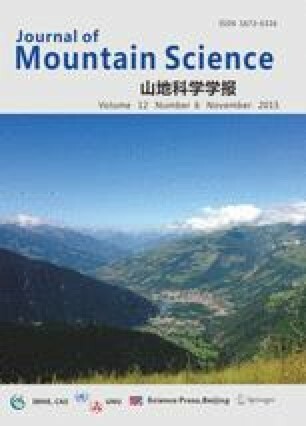 Interestingly study found that 28% area under moderate and maximum AHZ correlated well with registered avalanche sites when they were overlapped. The accuracy for such works can be increased by field survey under favorable weather condition and by adding data from more number of AWS for predicting avalanche hazards in mountainous regions.